Spokane's epic one-night-only art event happens Friday, Oct. 2. In striking contrast from one year prior, the air inside the 120-year-old Washington Cracker Co. warehouse is tinged with the woodsy scent of fresh sawdust in place of a musty, mildewy musk. The red-brick warehouse's transformation over the past 12 months from ramshackle relic to preserved historical landmark is remarkable, although the new life breathed into the three-story structure hasn't made it unrecognizable to those who'd seen it then. Much like the scene last fall in the days leading up to Terrain's annual one-night-only arts showcase — then its first show in the historic downtown Spokane building — organizers are aptly hiding the stress they're feeling. Foam-wrapped pieces of framed artwork yet to be hung are spread across the refinished original wood floors of the back gallery space that's to become the arts nonprofit's permanent home. With this gallery, Terrain will join other tenants already moved into the renovated multi-use building — Anvil Coffee Roasting, Overbluff Cellars and Coil, a yoga and pilates studio — and more to come, including Fellow coworking, an unnamed restaurant and a real-estate firm. Signs of construction underway are indicated by ladders and power tools stowed for the night. The manufacturers' labels still need to be removed from newly installed windows spaced across the red-brick walls, and a performance stage for Terrain's 10 bands is soon to be set up in a corner near a long, curving bar, another new addition to the space. Considering all that's left to be done over the next eight days from this moment in time, the building will undergo yet another major transformation in appearance before lines start forming. Organizers expect to see the most attendees Terrain has ever hosted; last year's attendance was estimated at 7,000 people. The juried show is displaying more art and artists than ever before: 295 pieces by 149 regional artists. "Every year I feel like I'm a broken record," remarks Terrain co-founder Ginger Ewing. "The more people you get, the stronger the submissions become, and when you have 1,300 pieces submitted and you only have space for 250, we're building walls because of the extra artwork." For its eighth edition, Terrain features a noteworthy list of artists who've never shown their work at the event, including its youngest artist ever: 8-year-old Olive Pete, whose series of digital photo illustrations is hung near the flight of stairs to the second floor. "For me, it's always about discovering something new and exciting about our town, and that's something I would highlight about this year," Ewing says. 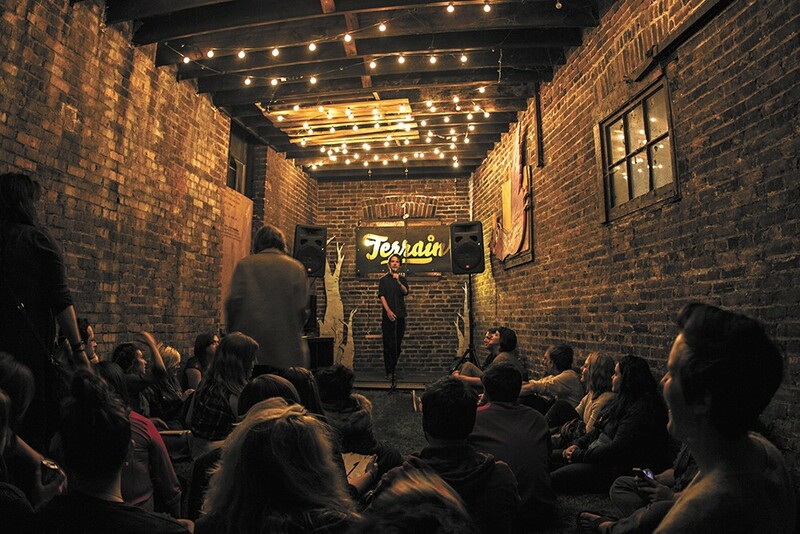 To build on the success of 2014's event, Terrain is bringing back its Campaign for Terrain fundraising efforts by offering calendar date sponsorships, along with a new Kickstarter campaign to specifically fund the installation of gallery lighting and a sound system for future events. While there's currently no set date for Terrain's permanent gallery debut, there are plans to host six two-month shows each year, Ewing explains, with special related programming and events during each show. Despite reaching a scale never seen before, much of what's in store at Terrain 8 are features that the community has grown to know and anticipate each year: innovative and edgy art in all media, live music by local and regional bands, poetry and literature readings, installation art and drama performances.